If you were seriously injured, you may be wondering whether you need to hire an accident injury lawyer. There are tens of thousands of practicing lawyers in Texas, and selecting one of these attorneys to represent you is an important decision that should not be taken lightly. You should choose a lawyer who has experience handling your type of case and will devote enough time to representing you at every stage of the personal injury claim process. Most reputable civil lawyers in Houston offer a free initial consultation. This is an opportunity for you to explain the details of your case, ask the lawyer questions about your case, and get a better idea about whether he or she is the right attorney to represent you. 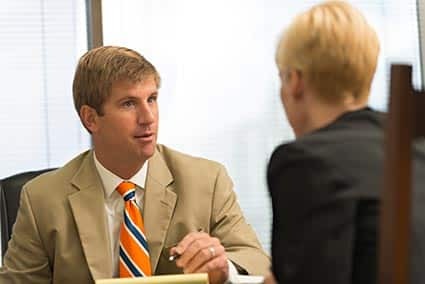 This post gives an overview of what to expect during a free consultation with an injury lawyer and what questions you should be prepared to ask and answer. Speak with a qualified attorney about your case. Submit the short form below to get a free accident case review. Where and when the accident occurred. The lawyer will want to know the precise date and location of the accident so he or she can determine whether Texas law applies to your case and if the statute of limitations has passed. The identities of the parties involved in the accident. Before a lawyer can agree represent you, his or her firm will need to make sure there are no conflicts of interest between you and any of their current or previous clients. The lawyer will want to know the first and last name (or corporate name) of the parties involved in the accident. The extent of your injuries and medical treatment. During a free consultation with a personal injury lawyer, you probably won’t have time to discuss every single detail of your medical treatment. But you should be ready to tell the lawyer about how seriously you were injured, what treatment you’ve had so far, and what your overall prognosis is. Whether you’ve had contact with any insurance companies. The lawyer will want to know whether you’ve filed an insurance claim or been contacted by the at-fault party’s insurance company. You should be honest with the lawyer and tell them everything you’ve discussed with insurance company representatives up to this point. If the lawyer agrees to represent you, he or she will probably communicate with the insurance companies on your behalf to make sure your interests are protected. Even if you were seriously injured, you may not have a valid personal injury claim. A reputable personal injury attorney will tell you during the initial consultation whether it seems like you have a valid insurance claim or lawsuit. Although he or she can never guarantee results or make promises about the amount of compensation you’ll receive, an experienced lawyer will tell you whether or not a claim or lawsuit is worth pursuing. Many people who have suffered serious injuries in an accident have never been involved in a lawsuit. Reputable personal injury lawyers understand this and will be willing to answer any questions you may have about the claims and settlement process. Although the lawyer won’t be able to make any promises or guarantees about the exact amount of time it will take to resolve your personal injury case, he or she can give you some general time frames so that you know what to expect. In Texas, most personal injury lawyers handle personal injury cases on a contingency fee basis. This means that the lawyer will get paid only if he or she secures compensation for you. The lawyer will take a percentage of the amount of money the at-fault party agrees to pay you (or is ordered to pay you by the court). During your initial consultation, you should ask the lawyer about how you’ll be charged for his or her services. What percentage of your compensation will the lawyer take? Who will be responsible for other fees such as court filing fees and expenses related to the discovery process? Will you be required to pay you anything if you lose your case or don’t receive a settlement offer? During a free consultation with a personal injury lawyer, you should ask the lawyer about his or her background and qualifications. Ask whether the lawyer has experience handling your type of case and how many years he or she has been practicing law in Texas. You should also ask if the lawyer has been subject to discipline by the State Bar of Texas. It’s also a good idea to ask the lawyer about the case results he or she has achieved for previous clients. You should also ask for references or reviews from past clients. You’ll want to know roughly what percentage of the lawyer’s cases that settle before trial. Although most personal injury cases filed in Texas settle out of court, you don’t want to hire a personal injury lawyer without trial experience. There is always a chance that your case will need to go to trial. At Sutliff & Stout, our Houston lawyers offer victims of serious accidents and their families a free and confidential consultation. To schedule your free consultation, call or text our office anytime at 281-853-8446. We’ll set up a free consultation with a personal injury lawyer who can evaluate your case and answer any questions about the personal injury claim process you may have.